Leveraging on the talent and skill of our professionals, our organization is also engaged in Industrial Shifting Services. Our professional have the information required for shifting of heavy industrial machines and other industrial amenities. We can also offer customized industrial shifting services pertaining to their exact requirements. In current days relocation from one place to another is most common for individual peoples or family or business companies. There are many reasons for such movement or say relocations. We are experienced in relocating industrial items, irrespective of the volume and weight. We are equipped with different types of crane and forklift facilities to handle any kind of industrial move. We can help in factory stuffing of such industrial items. At ICM Packers Movers we have first hand experience of Industrial shifting since already we have satisfactory Industrial shifting done to various customers in our kitty. 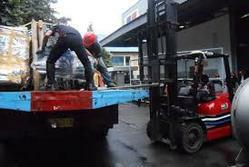 Our staffs are thoroughly professional and competent in carrying out Industrial shifting.